Site and Date of Introduction: Pacific coast of British Columbia and Washington and Alaska, and rivers and streams along that coast. Introduced prior to 1990s, but increased significantly in early 1990s. Mode(s) of Introduction: Through planned and unplanned escapes from fish farms, although species indigenous to the pacific are also escaping from fish farms. Reason(s) Why it has Become Established: Planned escapes were to study viability of hybrid progeny; however the population has not successfully established itself. All Atlantic salmon caught are thought to be escapees, whether planned or unplanned. Approximately 10,000 fish escaped in 1993. Ecological Role: In 1996 Atlantic salmon escapees constituted 0.004% of the yearly Pacific salmon catch. 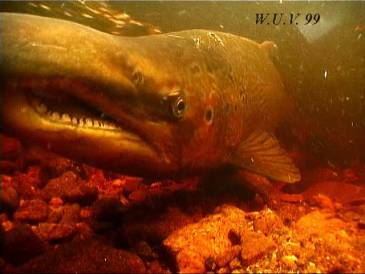 Farmed salmon continue to escape from pens on an ongoing basis and to appear in the ocean, rivers and streams, evidently attempting to spawn, though no successful incidence of this has yet been recorded. Benefit(s): Commercial fishing – minimal yield to date, although there have been landings of 864 fish per year in early 1990s, except 1993 when it was higher due to a higher number of escapes. Threat(s): There is a potential fear of genetic alteration of native populations, including alterations that may threaten viability of native species which might reduce fitness and disrupt genetic diversity. There is also a possibility of interbreeding, competition, disease and parasitism; however, these things have so far not occurred. Control Level Diagnosis: Minimal priority. Considering the difficulty of producing viable hybrid progeny in the lab crossing Atlantic with Pacific salmon, the threat to native populations is somewhat in abeyance via interbreeding. To date, there is no evidence that Atlantic salmon have reproduced in the wild among themselves or with others, though it is expected they will try to spawn amongst themselves (there is a greater probability of successful breeding with native populations by indigenous Pacific salmon escaping from fish farms into the wild); conversely, there is no significant benefit deriving from the presence of these fish on the west coast, so their artificial presence, potentially disruptive, might as well be terminated. Though projected threats have so far not materialized, there is no reason to incur these risks. Repeated failures to introduce Atlantic Salmon in this region and continued high mortality suggest that there is little threat either of interbreeding or challenging indigenous populations. Control Method: Stop introducing them in Pacific fish farms. Stop escapes from fish farms of the existing population by terminating planned escapes and by eating or selling the Atlantic salmon on hand. If there is no further importation, it should put a stop to their presence in the Pacific northwest.